Our family took a nice break from work and headed north to Vermont. There are plenty of big, industrial northern cities, in the US, Europe, Russia, and Asia where they deal with cold and snow very well. Take Minneapolis, for example. Subzero temperatures, cold fronts, snow drifts, and frozen lakes and rivers just means you use an electric warmer for your car’s engine block, you have a snow blower, the streets are regularly cleared, and the tough UPS guys still wear shorts, although they wear snow boots. Russians almost don’t know what warm weather is like. Swedes and Norwegians, and particularly Finns act completely nonplussed going about their lives in the cold north. But in Vermont, snow, ice and a long, protracted winter are somehow different, in my mind, probably because I go there to enjoy myself, not to work. There are more dairy cows per people in Vermont than any other state. So, naturally, milk, cream, butter, cheese and of course, Ben and Jerry’s ice cream taste wonderful. We once visited a dairy farm in northern Vermont in February. The farmer’s son showed us around, taking great pride in pointing out how happy the cows were in the long dairy barn, how clean the milking equipment was, and how equally clean the cows were. And he was quite right. His cows’ milk was used to make Cabot cheese, produced in Cabot, VT, as you might have guessed. One of the pleasures of visiting Vermont is enjoying the local products such as artisinal cheeses which are hard to get outside the state. 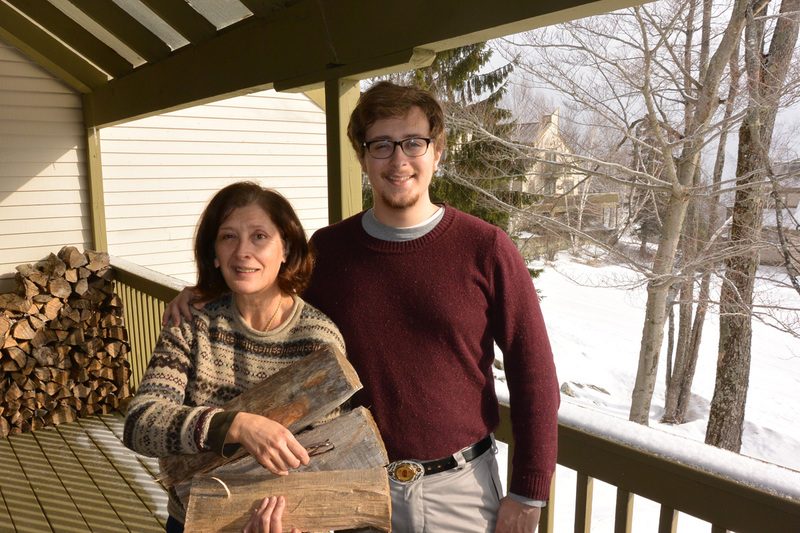 Each year we go to Vermont, we are sure to bring home a gallon of Vermont maple syrup. Kept in our basement, it lasts for a year, and is very tasty. It is fun, knowing it came from the trees in the woods where we were staying. 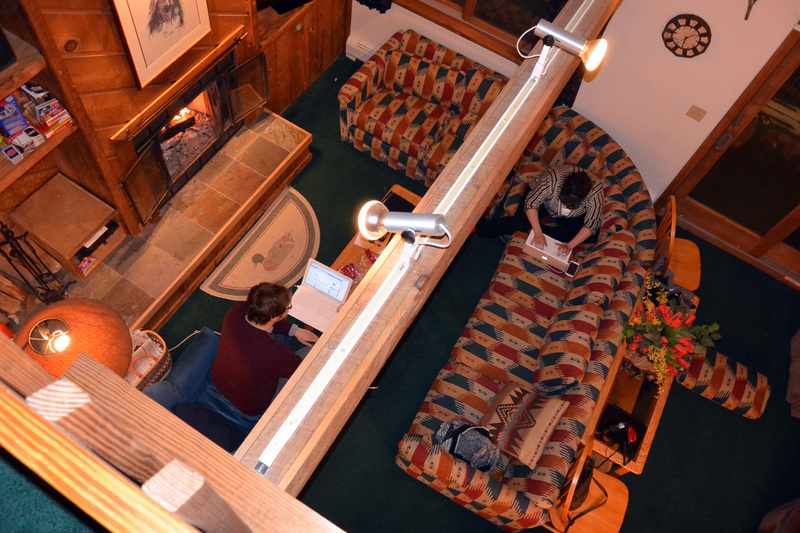 Warm and comfortable condo high up Okemo Mountain. 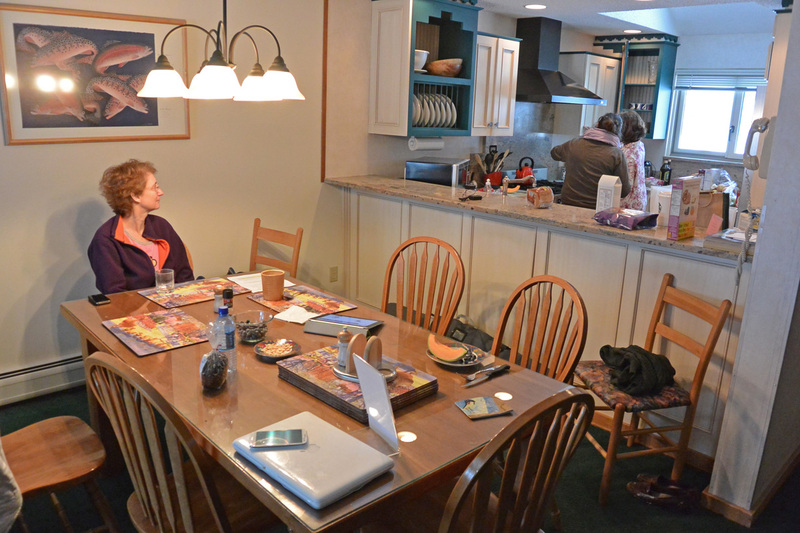 We stayed in a lovely four bedroom condo high up Okemo Mountain, along the Sachem Trail. Two of our three grown children, a friend of ours, Lynn, from Philadelphia, and my college friend Keith and his wife Lisa stayed with my wife and me. We made some truly great meals, had some very nice Vermont beers, some excellent wines we brought with us, and thoroughly enjoyed the condo, especially the fireplace. Lynn, who cooked the first dinner, a delicious chicken stew, observes breakfast in the making. To be fair, my son did offer to carry the wood. On the other hand, my wife does Brazilian Jiujitsu, so this was her opportunity to get a little lifting in. 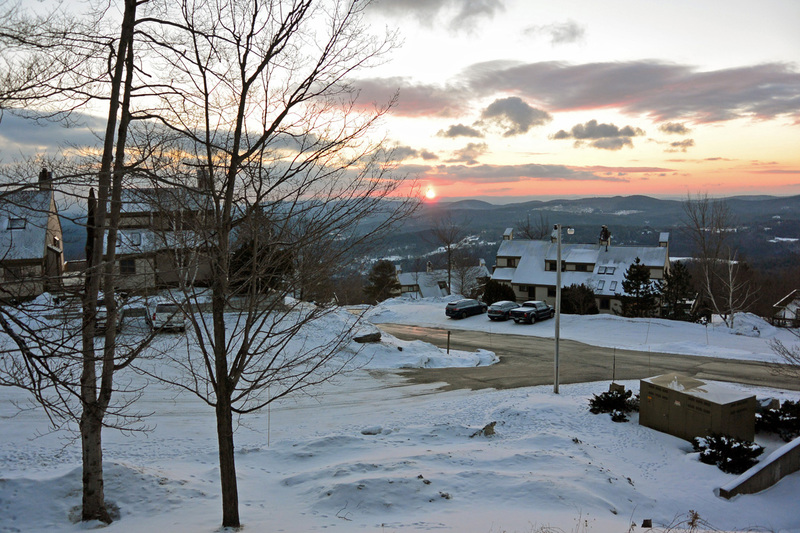 This year, fortunately, the snow gods smiled on Vermont, and laid down some real snow. It’s just not the same skiing on the man-made snow, although it will do if necessary. Recognizing that it is not, perhaps, as eco-friendly as one would like, to make snow so skiers can ski on it, the resorts do their best to adhere to ecologically sound practices. Without snow to ski on, the skiers would stay away, which would seriously affect the economy of the communities who rely on the ski resorts for their livelihoods. Getting out to the ski slopes was very convenient. We walked about one hundred yards, climbed up a little hill, clipped in and skied. My kids, Craig and Katie, snowboarded. While conditions were not the greatest, they were far from the worst, and we were able to get in several days of fine shushing and carving. Craig and Katie pose at the top of Sachem trail, were we got on the slopes from our condo. Something that made this trip particularly special was getting to ski with Keith, my friend from college. Keith introduced me to skiing about forty years ago, when we were at UCSD. We went on a long bus ride from San Diego, to UCLA to pick up their ski club members, then on to Telluride, Colorado. It was a memorable trip, not least for being able to learn how to ski. My one prior experience was a weekend at Heavenly, at Lake Tahoe. With too few funds to pay for lessons, and not knowing what I was doing, that was a big challenge. But at Telluride, I was able to pick up some pointers from Keith, and with the fact of being young and able, I managed to learn to ski. Since then, while never achieving the kind of graceful and skilled skiing of someone who learns as a child, I have become a devoted skier. Keith and I don’t get to ski together too often, the last time being some time in the 1980’s. 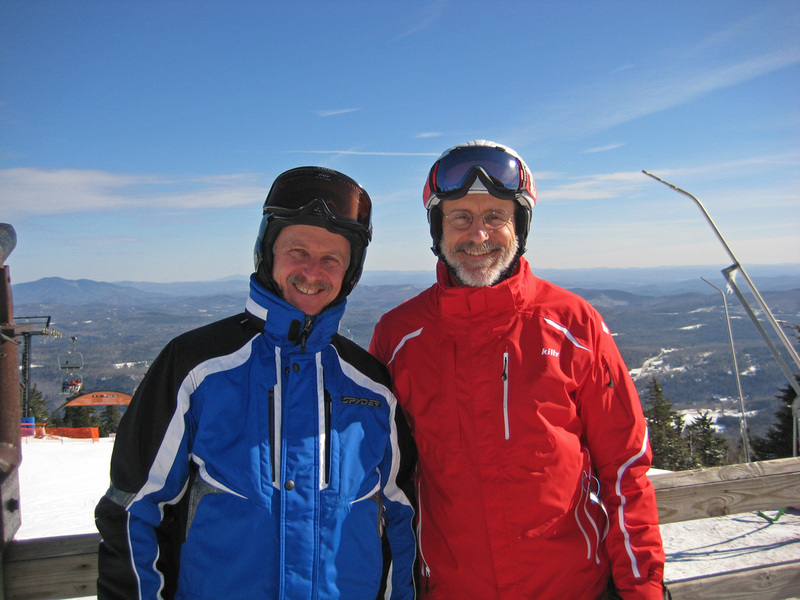 Keith and Frank at Okemo, Feb. 2013. Skiing is an activity that the whole family can enjoy, no matter one’s age. It is a little tough at first with young children, carrying their skis, supplying them with mittens, scarves and face protectors, and dealing with the frequent wintertime illnesses which always seem to hit the day one leaves for the mountains. But, once they learn and become more independent, they love it. Since they are grown, the family ski trip continues to be a way for us to get together and enjoy each others company. My oldest daughter, away at graduate school, could not join us for this trip, but would have in a flash had her schedule allowed. 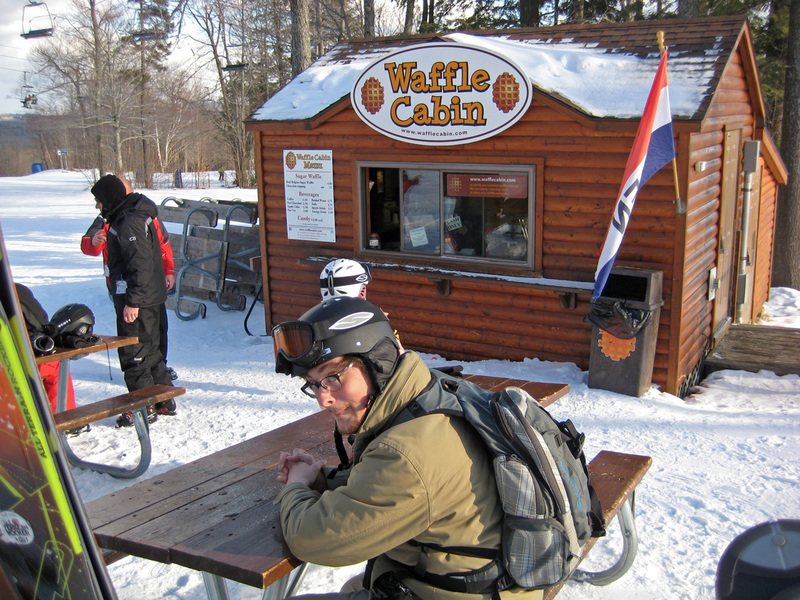 Craig, awaiting a bit of sustenance in the form of a Belgian waffle. Skiing is a way to embrace the cold and snowy days of winter, get outside and revel in it and work up an appetite for good winter food. 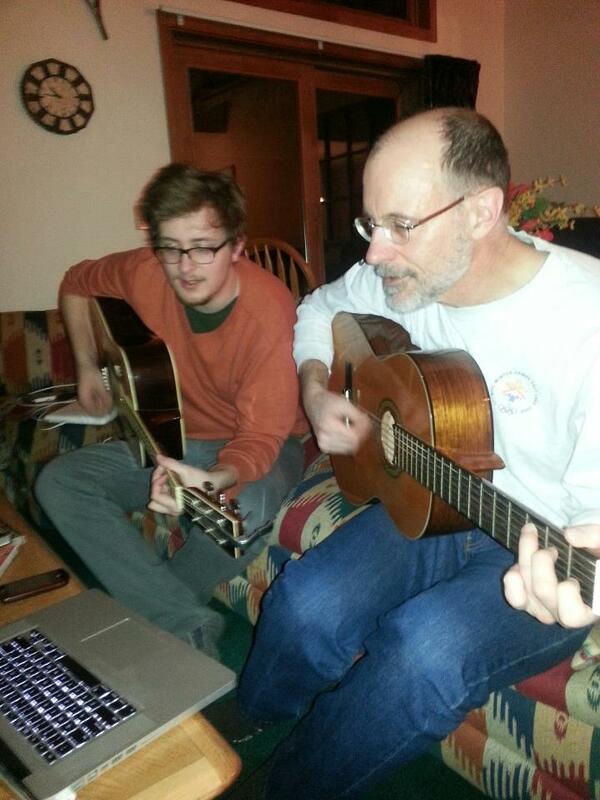 The dark comes quickly in the winter in the mountains, and that means gathering around the fire, reading, playing Scrabble, and even playing a little music, with chords and lyrics courtesy of the internet. Playing some Velvet Underground, Craig and Frank. Photo by Katie. Relating this all to running, I did bring my running shoes, and had planned to get in a run or two in the later afternoon. What I found, though, was the road to our condo was narrow and icy, so it would have been dangerous to try running along it. Instead, I just relaxed, knowing I wouldn’t miss a few days running, and just enjoyed being in Vermont.